According to my son, today is “WALL-E” Day. According to him, 3 years ago, we had planned to go see this movie at the “cheap theater” ($1.50 I think) as a family to see this. However, on that day, he was “sportin’ a ‘tude” and had a bit of a meltdown. So we decided that it would be best if he stayed home, rather than take him and his issues to the theater. So I took my daughter, just the two of us, while the boy stayed home with his father. He finally did get to see the movie, about a month later when it came out on DVD and we bought it. 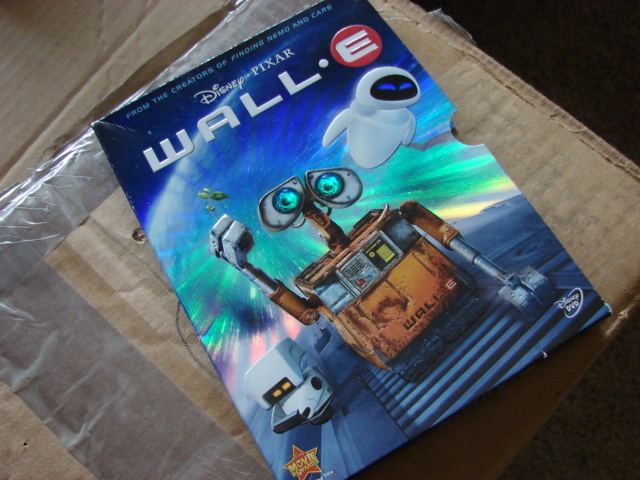 We didn’t think anything more about it until the following year, on this date, that he said it was “WALL-E” Day and we needed to celebrate by watching the movie, and ever since then, October 13 has been the boy’s special “holiday”. When he mentioned it last night, my husband wondered aloud just how many years we’d be acknowledging this made up holiday. I reminded him that our daughter was celebrating a stuffed animal’s birthday for nearly 4 years before she moved out of that phase (it did provide this mom with an excuse to make chocolate cake though!). Is the last year of celebrating “WALL-E” Day? Only the boy knows! Well, in light of Pat Robertson’s advice that it was ok to divorce a spouse with Alzheimer’s and marry someone else, I felt the need to address this topic. I’ve already shared my feelings on Facebook, strongly (to put it nicely) disagreeing with Pat’s advice. So I thought that I would share, some personal stories, from my own family. 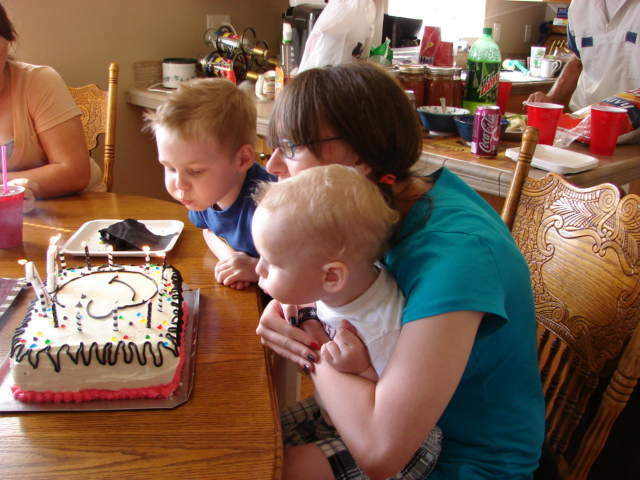 Two very different examples of caregiving spouses. My grandmother was diagnosed with Alzheimer’s back in the mid 80’s. By that time, she had had several other health issues as well. My grandpa retired early to stay home and take care of the house and her. She had diabetes, asthma, arthritis, and depression. So she really wasn’t up to housekeeping, or much cooking. She wasn’t an invalid, but she didn’t have the drive or energy to do that (thought her ability to complain was uneffected). So when my grandma was diagnosed with Alzheimer’s, my grandpa did was most well spouses do. He joined a support group. And there, is where he met his mistress. She had a husband at home with Alzheimer’s (the running “joke” on this is that perhaps, since they met at an Alzheimer’s group, they forgot that they were already married). It wasn’t long after that, that my grandpa put my grandma into a memory care home………..and then, they started taking day trips together,and started spending the night at each other’s homes and his visits to see my grandma were less frequent. Then he told my mom and my aunt and obviously, they had some issues (like, “Um Dad, you’re still married”). Well he blew them off, and then, soon, introduced us to her, and she wasted no time being Grandpa’s spokesperson, always feeling the need to correct us. Once her presence in Grandpa’s life was established, my mom and aunt were asked to return their keys to their parents’ house. Grandpa suddenly had an answering machine and rarely returned calls. This was hardest on my aunt, because she lived a mile away from her parents for many years, and they had been her support (if you could call it that) as she had an alcoholic husband. Now, I’ll interject here, that I do realize that my grandpa allowed this other woman to influence him. He made the choice to gradually push his children and only grandchild (me) away. I remember how upset my mother was when she’d try to call on a holiday to talk to him and just got the answering machine. Until this woman came along, my mom, her sister and parents called and wrote each other constantly. Now, my mom and aunt were feeling orphaned, abandoned and rejected by their own father. Because they were! This new woman had no interest in my grandpa’s family. Eventually, my grandma passed away, and the mistress’s husband did too. A month after he died, the mistress married my grandpa (her stuff had been moved into his house long before). Eventually, she tired of my mom and aunt trying to call, and talked my grandpa into selling his house (the one that my mom grew up in) and move to her house out in the country. They only gave us a mailing address, no phone number. My grandpa eventually disinherited his own children because of this woman’s influence, and he adopted and bent over backwards for her children, grandchildren and great-grandchildren. He stopped acknowledging birthdays, didn’t send Christmas cards, and didn’t come to my wedding. We saw him again the week before my mom died. I had to call information to get his step-daughter’s phone number to call her to relay the info to him that his daughter was dying. He and his now wife, came two days later to see her, which I was glad for. However, he totally ignored my aunt who was also there and the wife tried to usher him away from her anytime my aunt tried to talk to him. The didn’t sit with the family at the funeral either. They didn’t even speak to my aunt until it was discovered that she was dying as well. When my grandpa finally passed away a few years later, the other woman and her family planned his funeral, and were able to have a private good-bye. I got a phone call saying that he had died, and then I have to search the internet to find out where and when the funeral would be. Now this may sound like I’m holding some kind of grudge, but let me point this out. When you bring in another person, you have two selfish people serving themselves That other person is seeking to get rid of your past and anyone and anything from it. What did he have to show for his life when he died? He had no relationship with his family and the few who remained, he had discarded. This will probably be much shorter, because these grandparents, were best friends. They had mutual respect and a mutual admiration for each other. After my granddad retired, they had regular date nights in the form of dancing lessons. When the lessons were over, they went out every Friday and Saturday night, to whichever lodge had the best band and danced all night. They worked around the house together. He helped with the housework, and some of the cooking. When they went to shop at the mall, he would sit on one of the benches in the middle and chat with other husbands waiting for their wives, until Grandma came along with shopping bags, which he would take to the car while she continued shopping. They started traveling alot, and saw most of the world. He still called her “Babydoll”. 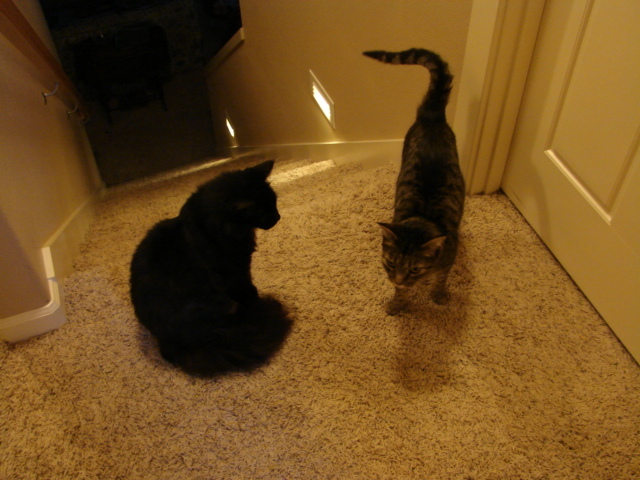 They had a warm and pleasant environment in their home, and I loved to go there. After some health issues, my granddad started to slow down a bit, and eventually they decided to move out of the house that he had built (large enough for nearly the whole family to stay in, and where we had had several family gatherings) downsize their belongings, and move to a manufactured home park. By this time, he was getting more forgetful, but he tried to stay busy, even when he could barely walk. All during that time, my grandma felt that it was her job as his wife to care for him, and she loved him. Even when he couldn’t remember out names, he knew how we were related to him. When my grandma once asked him, if he knew who she was, he paused and then said, “My Bride”. Eventually, it was becoming detrimental to my grandma’s health (she wasn’t getting the rest that she neededand had some heart concerns). So she made the hard decision, to put him in a facility. She visited him often, and was always concerned that he was being taken care of, that the clothes in his closet her his, and that he was eating. I went to visit him one day and he saw me, smiled and said to the nurse, “That’s my granddaughter!”. I stayed for about an hour (and by the end of that hour he was calling me by my aunt’s name). Soon after, he became ill with pneumonia, and was gone rather quickly. My grandma said more than once, “If I had just kept him home………..”. I think that had their roles been reversed, my granddad would have done the same for her. When he passed, he had many friends, family, children, grandchildren, and great grandchildren present, who he had a relationship with (as shown on the slideshow during the service). After viewing these two marriages, which one would you want to be in when you’re old? The selfish one or the selfless one? So I thought that I would answer that as well. Ten years ago, when I first awoke, I went to the computer to see what was on the ABCnews website. The first headline was that a plane had crashed into one of the towers of the World Trade Center. My first thoughts were that it was a small plane, like a Cessna and that it was an accident. Then I updated the site and discovered that another plane had hit the second tower, both planes were commercial airplanes, and that this was no longer considered an accident. So I turned on the TV, and called out to my husband, telling him what was going on. At the time, he was working a temp job, so I don’t remember if he was getting ready for work or not. My kids were 5 & 3, and had no understanding or interest in the news. Then that first tower fell, and soon after, the second one did as well, and I was shocked and grieved at thinking of all of those lives lost in such a short span of time. As the day went on, I kept the tv on. At one point, I did need to run an errand, and while in the car, driving on the freeway, I had the radio on, listening to the news, which at the time was describing where the President was going. I remember thinking that perhaps, that information should have not been shared. The word that I’ve seen on other blogs, describing the feeling that day is “surreal”. I felt that way as the day went on. Traffic was minimal while I was running my errand, and I had a sense that the world had changed and not for the better. My kids were going to have a different sense of being safe and secure than I did as a child. They don’t remember that day, and they don’t remember when the subsequent war started, but they’ve heard us talk about it, and have heard news reports about it over the years to the point that this is their “normal”. A Little Love Note From My Girl….. I love Frontierville on Facebook! 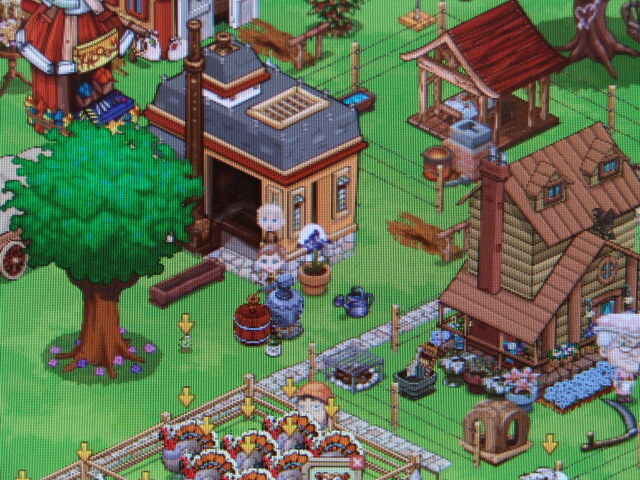 I used to play Farmville until it stopped giving me choices to expand my farm. So now, I have Frontierville, Cityville, and Pioneer Trail. I only have been playing one of those because really, it would take all of my day just to keep up with these virtual places and the missions that go with them. However, they are the cleanest farms/gardens/cities that one could ever tend to. Not long ago, I was on Frontierville, and I had several missions going in which in order to get them done, I needed to work on my “neighbors'” towns. So, being the list maker that I am, I wrote down all of the things I needed to do. Then, I left my computer so that my kids to have their time on it. 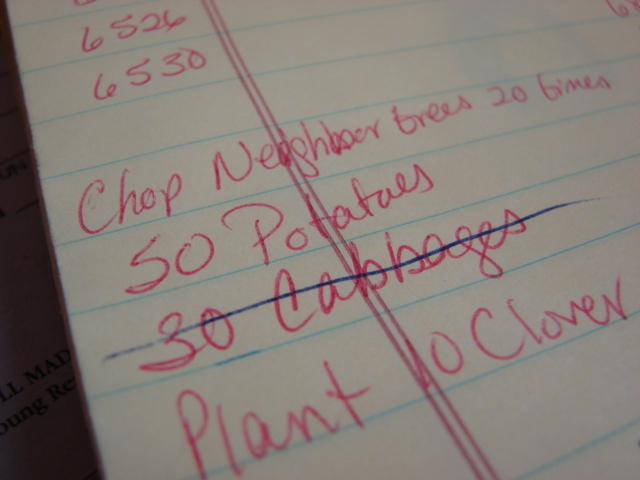 My daughter sees my list and wrote………. 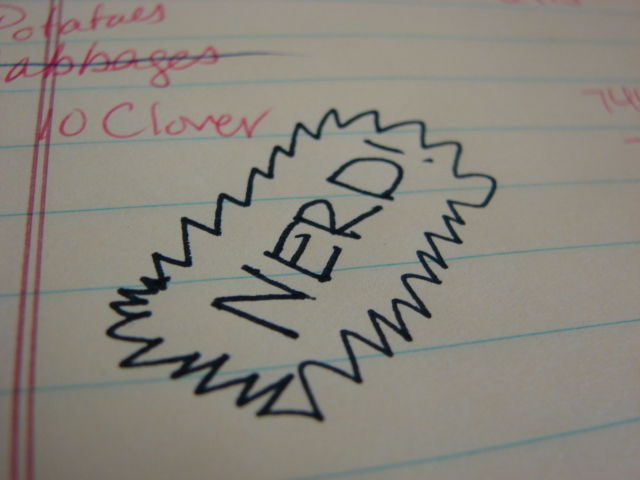 Yes, that’s me, I’m a “Zynga Nerd”! I need to find a more productive hobby…. A few weeks ago, I was in the mood to start making meals to freeze and then heat up when the weather starts getting nippier. 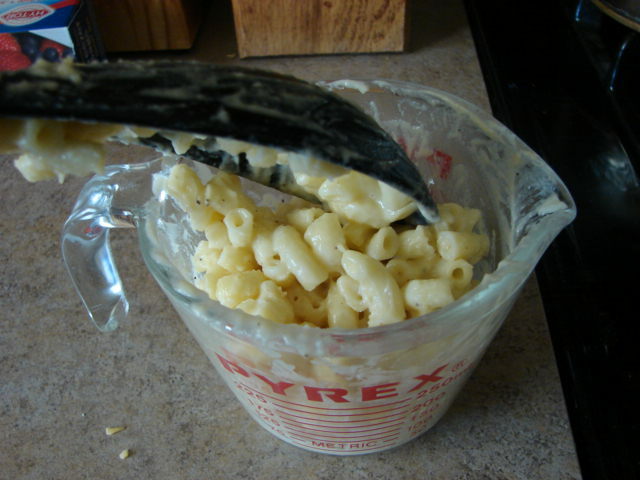 I had already made and froze a batch of soup, so this time, I thought that I would make some macaroni & cheese. 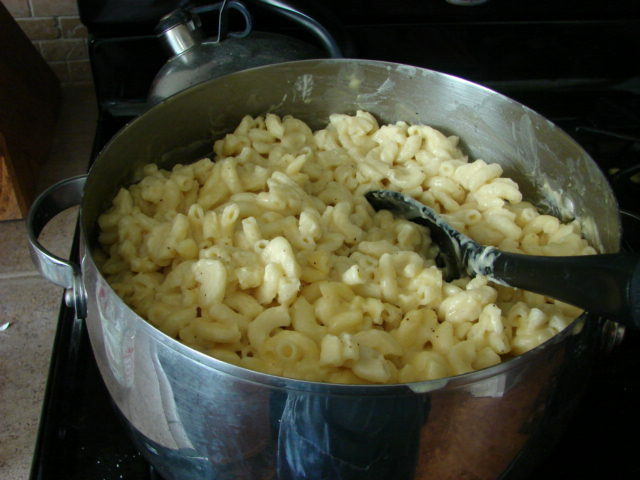 I have my mac & cheese (actually I multiplied the recipe by 4, and if I do that again, I’ll need to use a larger cooking pot). 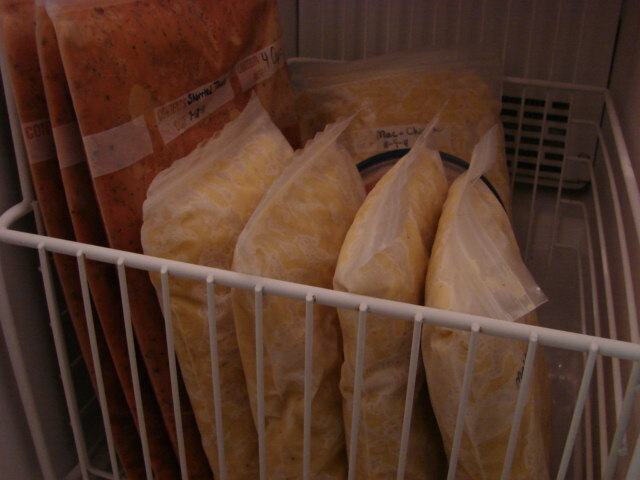 And I have my quart sized freezer bags…………. Measure out the amount that you think you’ll need (I have a teenage son, who is never full, so I pack about 2.5-3 Cups per bag). This part is a tad messy. If you need to spoon it into the bag, I won’t disown you! Please remember to wipe off the edge of the “zipper” before closing the bag. 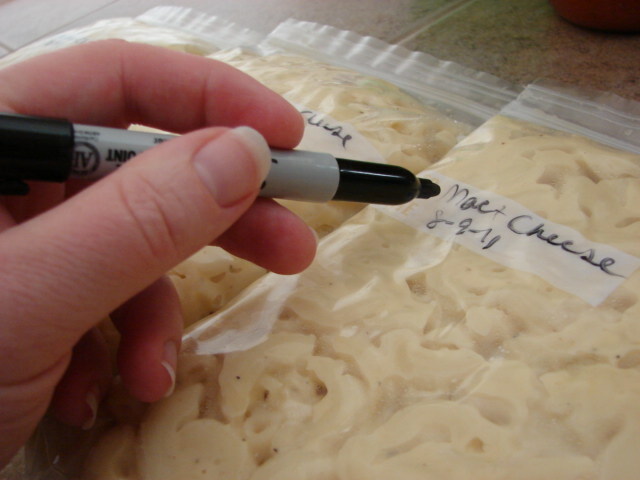 Don’t forget to label & date it (even though by looking at it, you obviously know what it is, and because of that, it will probably be on the dinner table within a week). Lay them flat in the freezer until they’re nice and solid…. 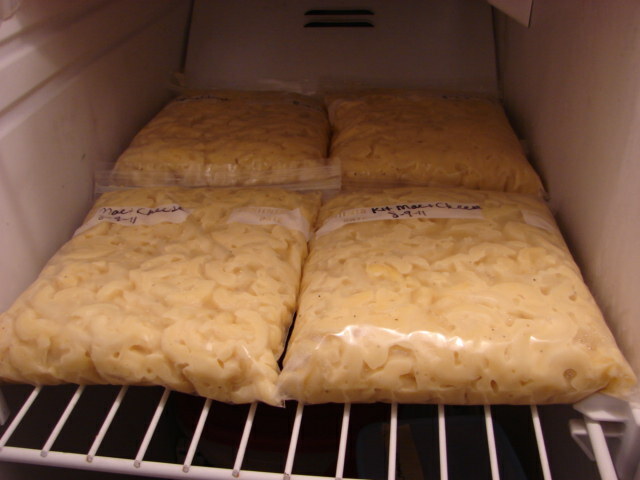 Once frozen, they stack or “stand” nicely in the freezer. I guess you could say that this meal stands on it’s own! Haha! 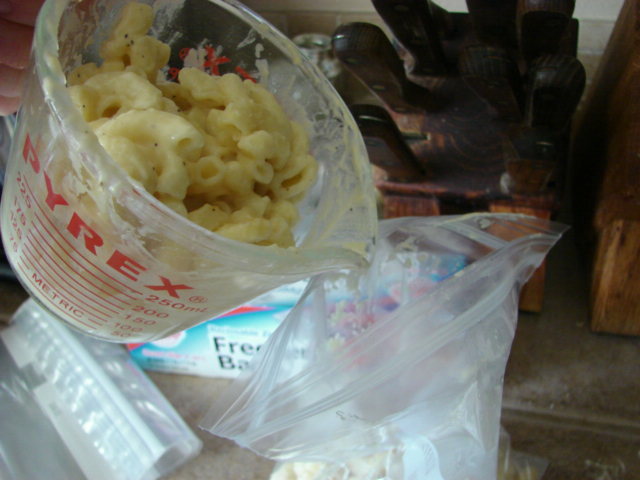 It turned out to be rather handy for me to have done this when I did, because while I was recovering from surgery, the kids were craving some mac & cheese and all I had to do was get a couple of packets out of the freezer to defrost, transfer to a baking dish and heat. Never Too Tired for a Birthday! Our girl had a birthday recently, however, she was away at summer camp when it happened. I packed in her bag a present to open and two packages of Oreos to share with her cabinmates (because I wasn’t willing to drive 10 hours to deliver homemade cupcakes). Before she left, she told us that she wanted to open her gifts from us as soon as she came home. I wasn’t so sure that she would be up to doing that after a 10-12 hour bus ride home. 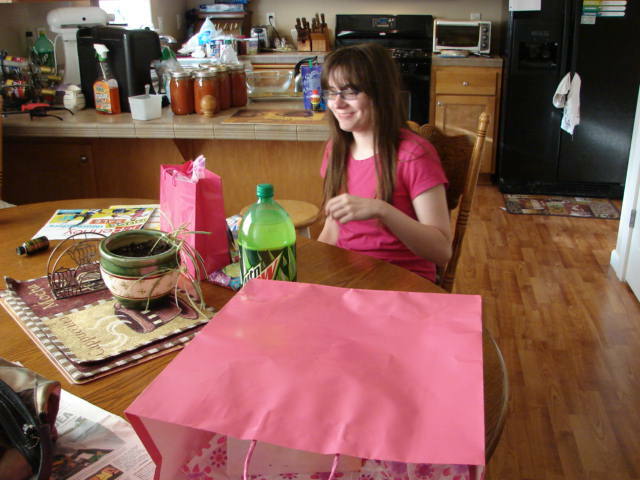 However, when we picked her up, she was hopped up on Mountain Dew and more than ready to tear into gifts! 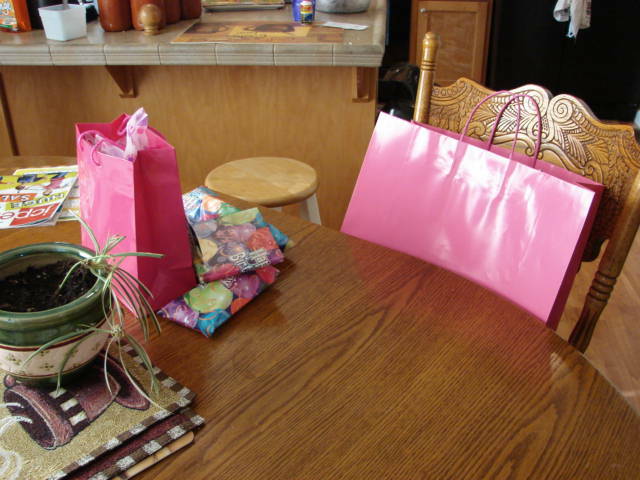 Presents ready (do you think that she likes pink?). The tired, yet happy, and caffeinated camper, ready to open her gifts. 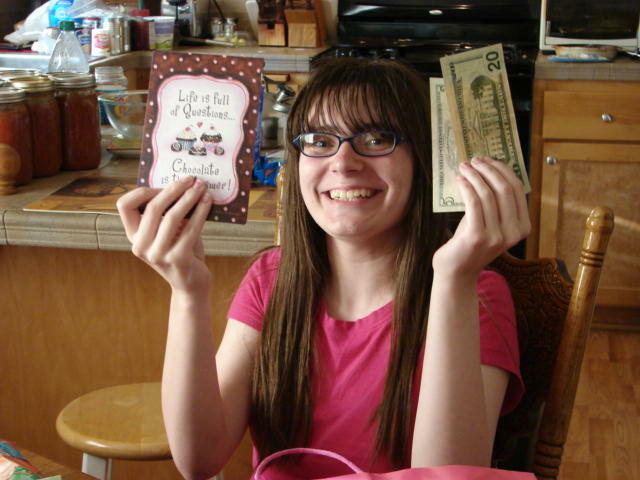 Teenagers never tire of getting money (and it’s already spent!). 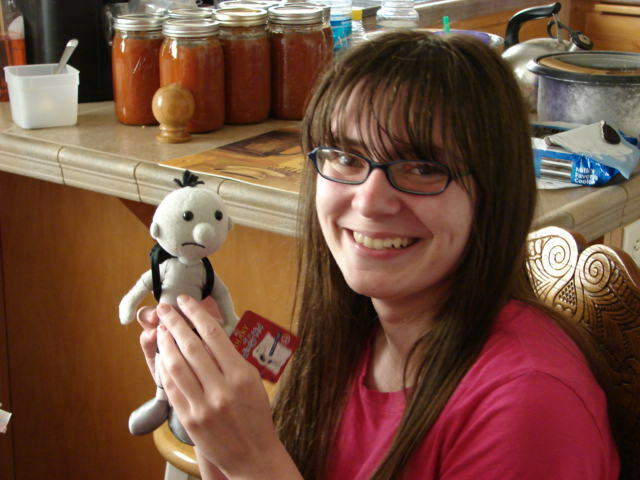 Her theme this year was “Diary of a Wimpy Kid”, and this little stuffed doll was a treasure. 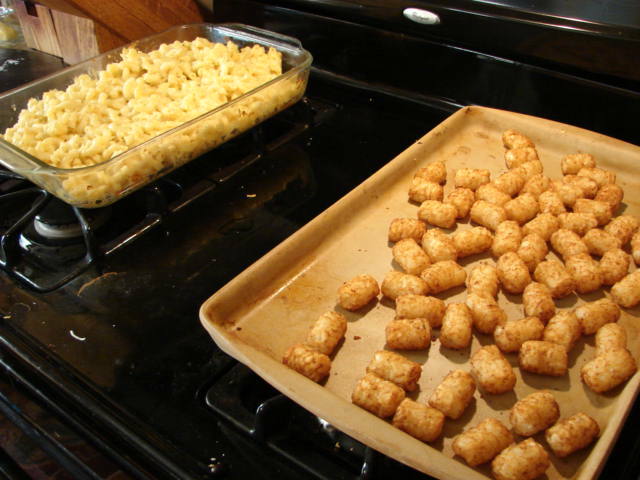 The requested birthday dinner: home made macaroni & cheese and tater tots. Starchy carbs all the way!! 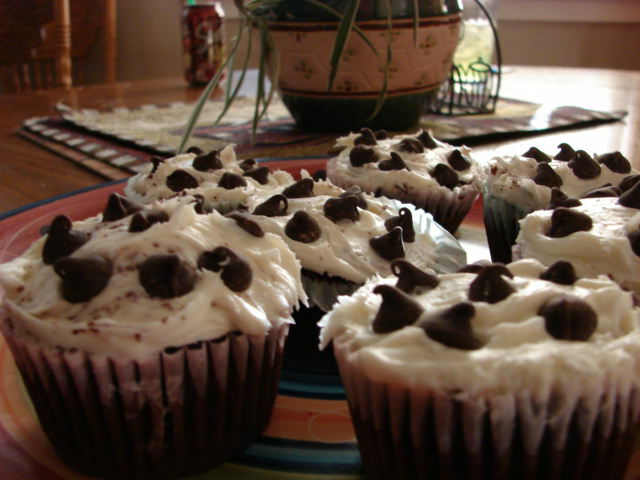 And for dessert, chocolate cupcakes!! 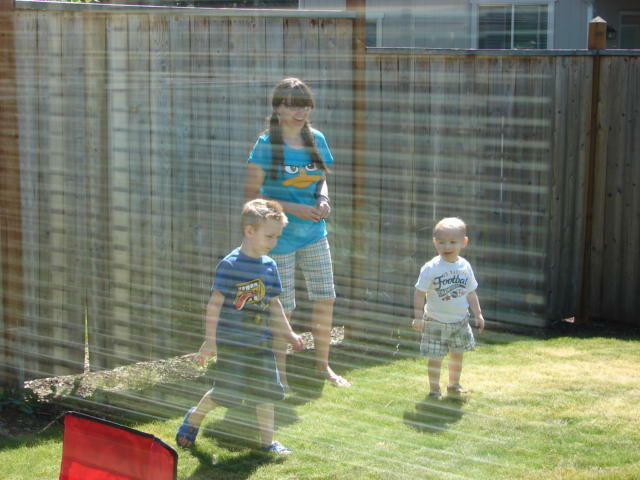 Even though it was the girl’s party, she spent most of the time entertaining two little cousins (which she doesn’t mind, and they LOVE her!). I could not have done this by myself. 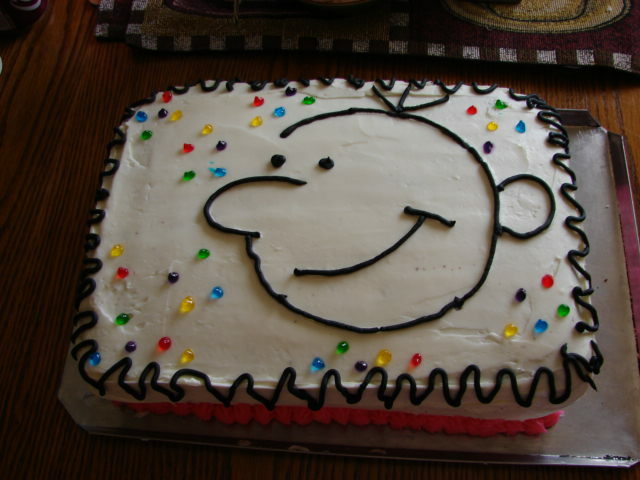 After I frosted the cake, my girl scored the Whimpy Kid face onto the cake and I piped the black frosting around it. It turned out very well! The birthday girl had help blowing out all of those candles! Nephew, “B” loves to play with baby dolls. 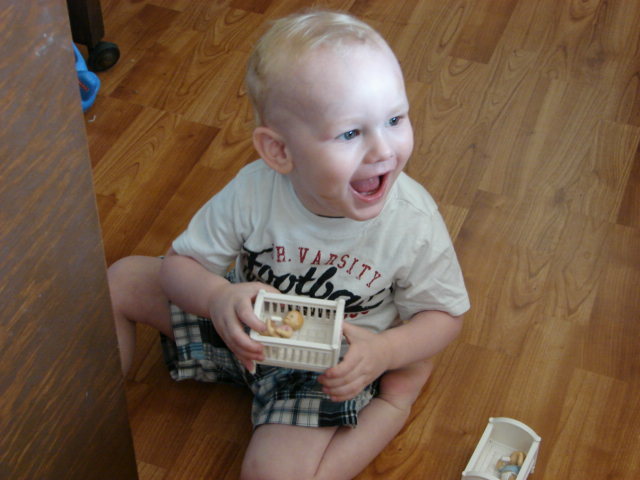 He and his brother were playing with our dollhouse and furniture (and a few naked Barbies). B was putting the baby in the crib and then rocking it and singing to it. Very cute! 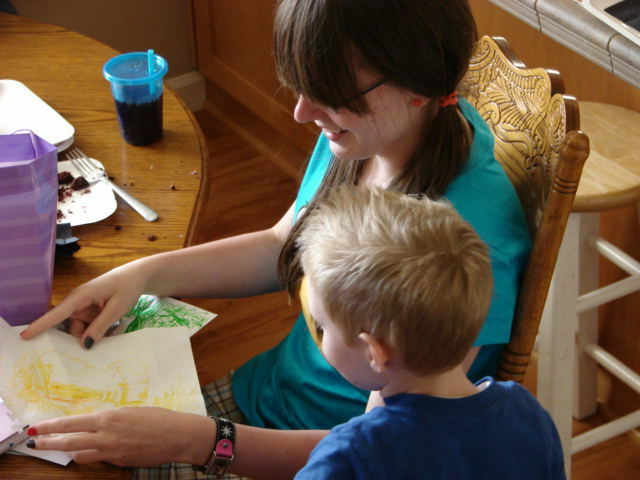 Nephew “D” was helping my girl unwrap her presents, including a picture that he drew for him by himself. The rest of the day included the kids playing on the Wii (during which, my 4 year old nephew stopped briefly and asked “Does everybody want to see my underwear?”), and then my girl and brother-in-law playing on the Wii (which he is now inspired to buy), followed by an attempt at a 4-generation family picture that my nephews and son didn’t want to be a part of (we got them in there anyway though, under much protest). Another birthday memory made, and another year to plan for the next one. The title probably tells it better than I can. So just a bit of a disclaimer here, before I go on, if anything is misspelled or just doesn’t make any sense, or you can mentally hear me slurring my words in this post, blame it on the Vicodin (ok, twice I’ve misspelled that word………and fixed it). Once again, this post is in “novel” form (meaning that I have no pictures, and after you read this, you will probably be glad that there aren’t any). Last weekend, was one of our normal weekends. I went grocery shopping. We ordered a pizza for dinner. We just kind of took it easy on Saturday. On Saturday evening, I went to church. All normal things. Then on the way home from church I started feeling sick, and then the sick feeling became painful. By the time I arrived home, I just needed to get inside and lay down and was feeling badly enough that I didn’t want anyone touching me. No matter what position I was in, the sharp pains in my back and abdomen would not go away. My husband kept asking if I needed to go to the doctor. Well, when do you really know? In the past, when I’ve felt that bad, as soon as I decide to go to the doctor, I start to feel better. By midnight, the pain was still there and I was nauseas as well. So at around midnight, I finally told my husband (just after he had taken some Benedryl and had gone to bed) that I thought that the ER sounded like a good idea. And as soon as we were on our way, the pain started to subside. 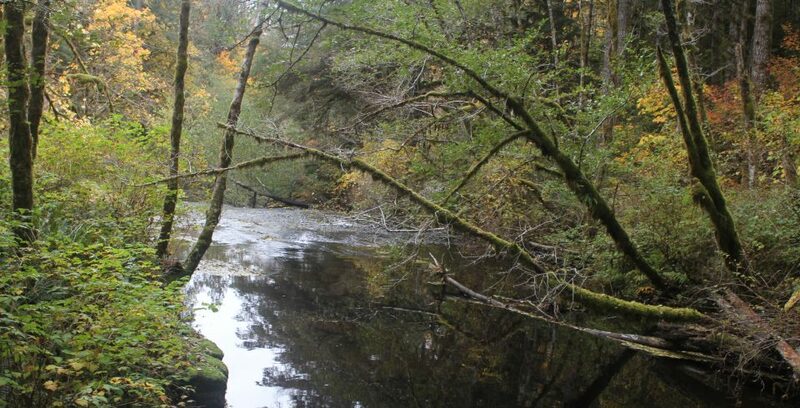 However, once there, and after explaining my situation several times to every new person who came to see me, and an ultrasound, and some poking around my abdomen, it was discovered that I was having gall bladder issues (if you’ve never had a gall bladder attack, it feels like the largest, most painful gas bubble that you’ve ever had). After talking to the on call surgeon, the on duty doctor (who was very nice by the way) decided to admit me for observation. In the morning, the surgeon came in and talked to my husband and I and it was determined that the best course of action was to remove the gall bladder, which should only be a day surgery. So, I called my kids at home to see how they were. I asked my daughter how her brother was and she offerred to give him the phone saying that “Mom was on the phone”. I heard him in the background ask her, in all seriousness, “She’s still alive?”. Then later in the afternoon, my daughter called again, and said that she and her brother were outside because when she turned on the gas stove, it smelled like rotten eggs, and she remembered that in commercials for the gas company, the announcer tells you to do that. So my husband went home to investigate and everything was fine (later on, I explained to her that if she smells the rotten eggs when the stove isn’t on, is the time she should be leaving the house, and in the future, it might be a good idea to wait to start cooking until a time when a parent is home). So Wednesday, was the day for the surgery. I wound up having two separate procedures done (being under anesthesia makes the day go by faster!). The first surgery was for the gall bladder and then the second procedure was to get a stone that was lodged in a duct that the surgeon couldn’t get to. The way to get that out was through an endoscopy (camera down my throat) As I was feeling groggy and like someone kicked me in the belly, I was wheeled into a room for the second procedure and the nurse asked me, “Did they tell you what position you’re going to need to be in?”. No I hadn’t heard. Then she tells me, “On your stomach”. So I had to scoot on to a table, and roll over onto my stomach with fresh incisions. Fortunately, I was sedated soon after. Needless to say, the powers that be felt that it was best that I spend the night in the hospital after all of that “fun”. So now I’m home, and if I even move a toe, someone is ready to tell me to not move and they’ll get me whatever I want. Some may think this an easy thing to do, but it isn’t. I’m on pain meds too, which make me feel loopy (which of course makes me want to prove that I’m still coherent). I’ve been told by several friends who have had this surgery before that I will feel so much better. I hope so! For the past week, my dear girl, Heather, has been away at church camp………….in another state……….in another time zone. This was the first time for her to travel out of state without her parents and, needless to say (but I’ll say it anyway), she was a bit anxious and also excited. While she’s been gone, we’ve been able to text each other so I was still able to tell her that I loved her before she went to bed. So, she still seemed close………sort of. It was also the first time that we’ve been apart on her birthday. She turned 15 this week, while at camp. I sent one gift (a “Diary of a Wimpy Kid” t-shirt) with her so that she would have something to open on her birthday, as well as some Oreos to share with her cabin mates (because this mama wasn’t able to travel to another state to bring cupcakes). So here at home, on her birthday, her dad, brother and I had a cupcake in her honor. Before she left for camp, she told me that she wanted to open her gifts as soon as she gets home. That remains to be seen. In the past, when I’ve picked her up after camp, she looks worn out, sunburned and just about ready to fall over. I’m picking her up this evening, so we’ll see if, after a 10 hour trip, she has any energy to open gifts. She might, and then she’ll sleep for most of tomorrow. As tradition goes around here (sort of because not everyone participates), when someone goes out of town on a trip, be it business or summer camp, I write a short note for each day for the traveler. 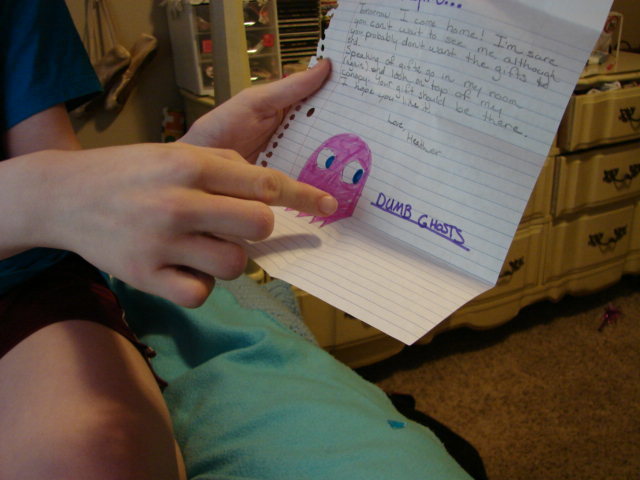 One year, my husband went away on a business trip and left notes for the kids with clues as to where a gift or treat might be. 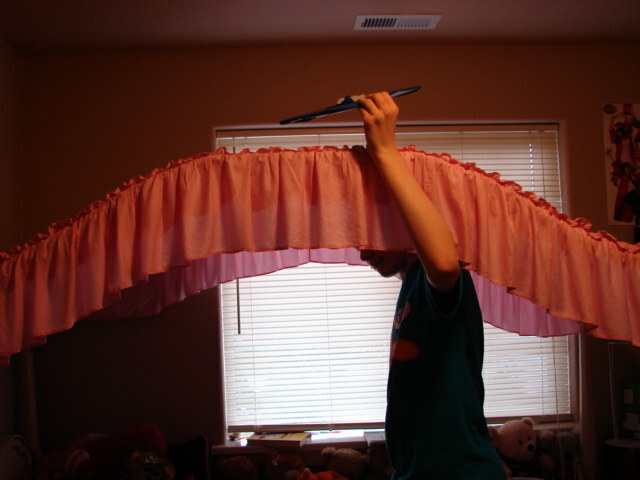 So my daughter took that idea and has been doing that with her brother. My son, Kylin, never likes it when his sister goes to any kind of overnighter or camp (protesting starts two weeks ahead of time). For the past two camps, at least, she has written a letter to him for every day that she’s gone and has left clues for him to find each day’s gift. Today is the last day for this little scavenger hunt, and the hunter is still sleeping! Today’s post is in novel form, meaning, that I don’t have any pictures to go with it. Yesterday started out as a fairly planned out day. I had a “to do” list all typed out in my phone. The plans included wrapping my nephews birthday present, cleaning the counters in the kitchen, show my son how to really clean a mirror (he thinks that he knows how, but the mirror always tells another story). I was going to cut the kids’ hair, pay a bill or two, and make some meals to freeze. The only thing that I did get done was to cut the kids’ hair. So at least their hair is no longer blocking their vision. I wound up needing to run a couple of errands. So that changed my plans as well. Then, in mid-afternoon, I received a text from Kevin, suggesting that we attend a city council meeting in a small town about 45 minutes away. We, along with some of our friends, started a political watchdog group about a year ago, with the goal of keeping the public aware of discrepancies and such in our local government. 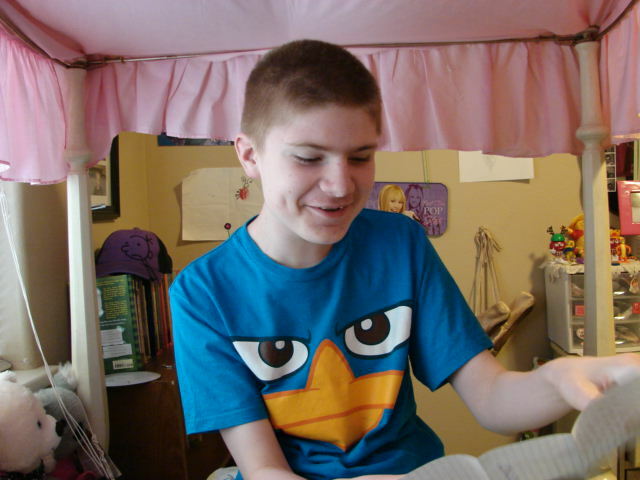 Kevin and the other guys have written articles for their blog about them as well (I wrote one about homeschooling). Mostly, I contribute with ideas, and for when meetings were at our house, I made a lot of muffins. So, part of what was going on at this small town was that a significant amount of money was missing and there were some in the town who were petitioning to have the mayor, and the city council recalled. So, we went out to this small town, listened to what the people had to say, and at the same time, it provided another Civics lesson for my kids (who were bored, but they’ll remember it when they’re adults). So for this impromptu trip, it meant dinner-on-the-go, meaning burgers. To keep the ketchup and mustard on those burgers from dripping into the laps of those of us who want to be taken seriously at a meeting, I put those burgers in coffee filters. 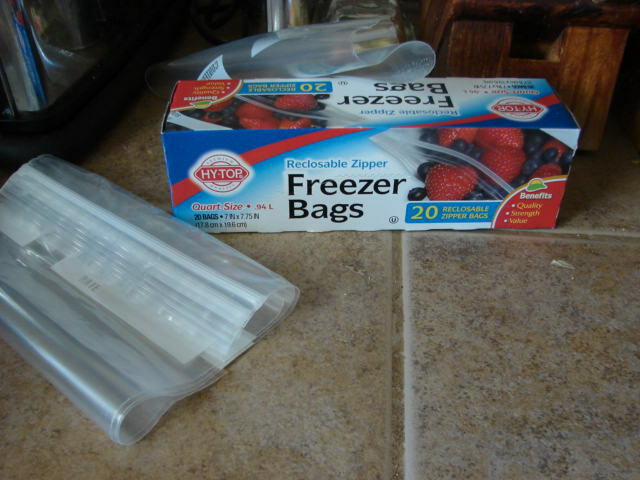 They’re handy for now and make nice “catch-alls” until I can go to a Cash & Carry and get the wax paper burger wraps for future last minute, meals to go. I hear a cat meowing at the door at around 6:15. So I get up and get ready to make coffee. However, at least one of these is waiting to greet me. So we head downstairs and this is what comes next in our routine. I hear a cranky meowing at the front door. 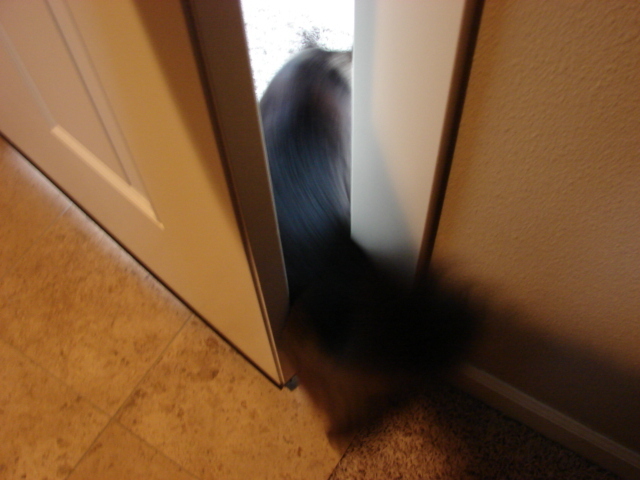 So I let Fonzie in and she promptly runs to the door leading to the garage (and the food). 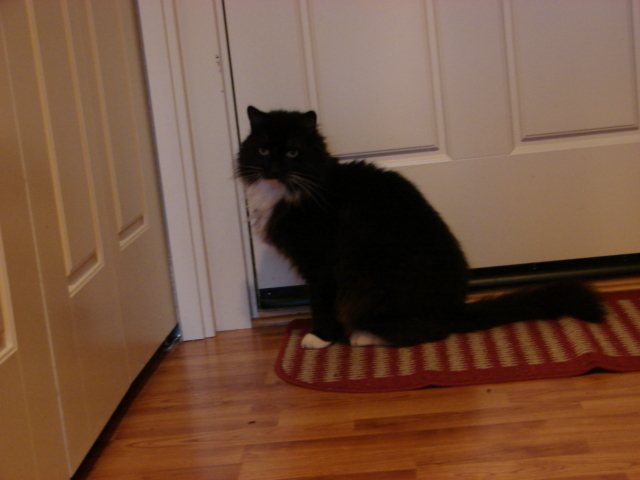 So I let her go out there, and just as I think I have a moment to start grinding coffee beans, I hear Oscar meowing, betting to be let out of the front door. So, out he goes, to wonder off to our porch furniture and snooze on it, leaving hair on the cushions. So now we’re back to Aslan. By the time this picture was taken, he had been out in the garage for food, then back into the house, then outside through the back door, then back into the house and now he wants to go back to the garage, as if something about it may have changed since he was there last. I kept track as to how often I was opening and closing doors in the morning. The number on this day was 11 times within a one hour period (before I saw any of my human family members). There was a short time frame in which I did get coffee made.